Today for #SundaySupper we are sharing with you recipes that are 5 ingredients or less, not including salt, pepper, oil or water. You have to love simple recipes that do not contain a lot of ingredients. Last weekend as you may have heard I went shopping at the Berkeley Bowl with my #SundaySupper pal Marlene, from Nosh my Way. When we were shopping I saw some beautiful heirloom tomatoes that I just had to buy. I had no idea what I was going to make with them, then the craving hit. I wanted a BLT sandwich, but I didn’t have any bread. That just makes me sad and frankly I am just to lazy to go to the store to buy a loaf of bread. So what does a girl do to kill those cravings? Improvise and make something even better! I saw those little tomatoes on my windowsill and started to chop away to make BLT style salad, but with a little bit more oomph. 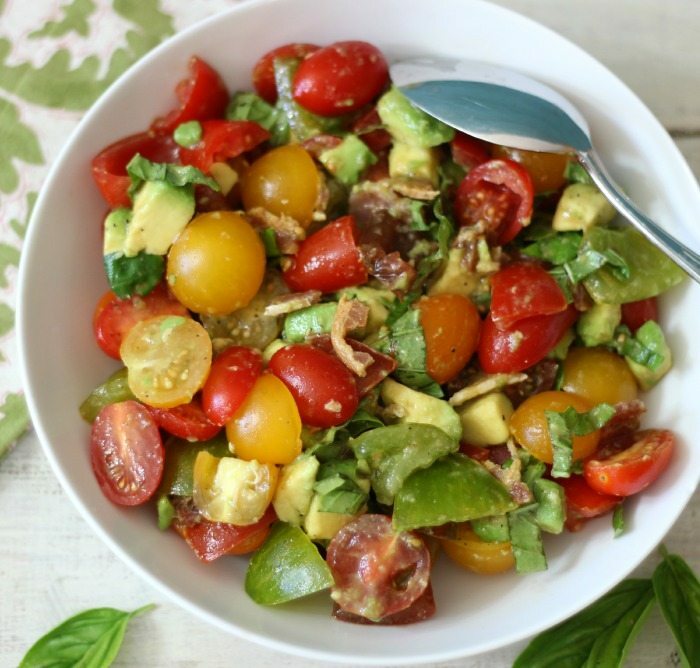 So today I am sharing with you my Tomato, Avocado and Bacon Salad. The salad is light, full of flavor and creamy from the avocado. Since I used heirloom tomatoes, and a few of them were super dark red you couldn’t see the bacon. Talk about a surprise when you take a bite. Your like dam, was that bacon? Oh yeah! The bacon adds a little extra love to it, and you know everything tastes better with bacon. I also used some fresh basil from the garden and just a pinch of salt, pepper and olive oil. Super simple tasty salad that makes a perfect side dish or if your like me, you just want to eat the whole bowl. 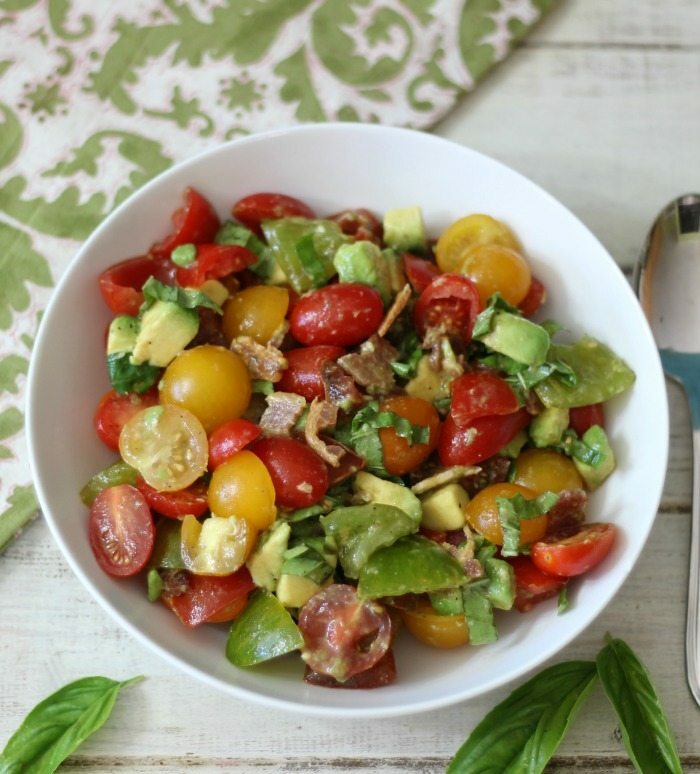 A light, summertime salad made with tomatoes, avocado, bacon, fresh basil and a little bit of salt & pepper to make the tomatoes juicy. Add all ingredients in a bowl, and gently toss until combined. Cover and refrigerate until ready to serve. Note: If not serving for awhile, add avocado just before serving. I am loving summer produce. My herbs are doing great in the garden and I am patiently waiting for the tomatoes to ripen. Then I can have this salad all summer long. Be sure to check out the 5 ingredients or less recipes from the #SundaySupper gang below. Just the other day I made a BLAT (bacon, lettuce, avocado, tomato sandwich) and didn’t even think about making it a salad instead. Brilliant! YUM! 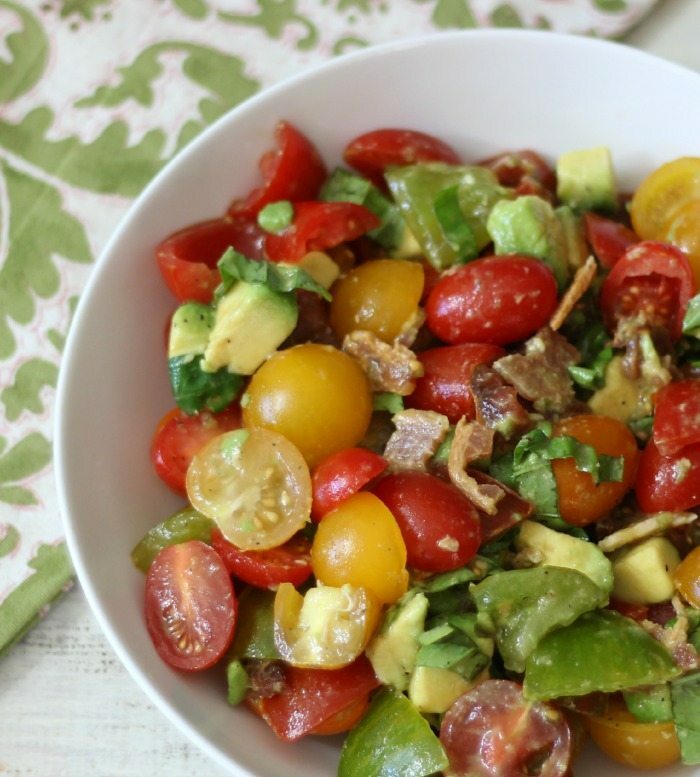 I love anything with avocado…AND bacon! This is the first time i have ever had bacon and avocado together, oh my gosh, I love it! Such a gorgeous, healthy salad! What’s not to love??? Oh, those green zebra tomatoes are my favorite! So flavorful. 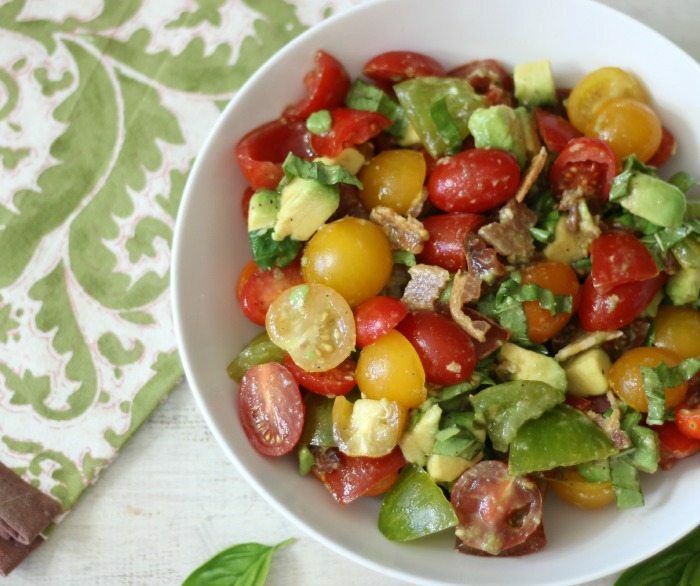 This salad is how I eat all the time, minus the bacon, but I’ll have to go for a splurge! I love simple salads like that and I had bacon, so I had to do it! 🙂 The Zebra Tomatoes are delish. This is one of our favorite meals. My husband actually asks for it! I do add grated cheese to it. Yum! Love the grated cheese to it. After I made it I thought of adding mozzarella balls to it. Great flavor combo! This would be a perfect light summer meal. this looks amazing….so got to try it…! p.s: back here after a long time, great to be back, and see ur amazing recipes…! Thank you for coming back! Thank you so much for your kind words. Oh I hope you like it as much as I do. Looks delish, I want an extra big scoop please!! You can’t go wrong with these flavors!